Any investor in Netflix (NASDAQ:NFLX) knows the standard touch-points that are frequently hit on by analysts – lack of ratings info, a perceived over-spending on shows and the company’s long-standing quest to conquer the movie industry chief among them. When any news tied to any of those areas comes out, it is like catnip to the media. Netflix is one of the rare companies that can subscribe to the “any coverage is good coverage” mantra as they just enjoy being in the conversation. As analysts have seen, it thrives off of speculation and conjecture because everyone knows it won’t comment so it just creates more and more buzz around the content. Yet in the case of Bird Box, something new happened. The company DID respond and put out actual data on viewing, but more importantly, it then ELABORATED on that data giving investors a rare glimpse behind the curtain – which ultimately just created more questions. It is infuriating. Netflix has again managed to reveal “just” enough to spark a new conversation but not enough to reveal anything to give their rivals any type of edge. Or did they? That’s the question investors and analysts are scrambling to make sense of and overall it’s a fascinating situation. First, as always, some background. Netflix’s goal to be as dominant in film as it is in television is well-documented. The problem is largely two-fold. Part of it is the film industry is well aware of how the TV industry basically sold itself out of power and the other half is the company under-estimated the power of a shared experience like going to the movies. However, over the last few years, Netflix has doubled down on their efforts by recruiting top tier talent like The Coen Brothers, Martin Scorsese, Alfonso Cuaron, Will Smith, Adam Sandler and most recently Sandra Bullock. Bullock is one of the most beloved actresses of the modern era. Not only is she talented, but she’s gone through the fire and came out unscathed. She’s as versatile as she is intelligent. The feeling with former Universal executive turned Netflix film czar Scott Stuber was that audiences would flock to her films whatever the medium. According to Netflix, her latest project Bird Box (which he brought over with him) was viewed by 45,037,125 subscribers – a new record for a Netflix movie over its first seven days. The problem is that not only is that number oddly specific, it is mind-boggling. If taken on the surface, that would mean roughly 1/3 of all Netflix subscribers watched the film. Now some people have taken this to the extreme and tried to put a dollar value to it, which is even more absurd and investors should pay it no mind. The logic is that if you take that total and multiply it by the price of a movie ticket (roughly $9.16), then Bird Box would have made around $413 million at the box office. To give you a comparison that’s Star Wars: The Force Awakens type money. Again, that is ludicrous and even Netflix would never be so bold to infer that (though it has come close in past instances). Not only is it nowhere near an apples-to-apples comparison, but it also furthers the narrative and Netflix knows that so it has no reason to even attempt to set the record straight. What was so unique this time, though, was many media outlets asked for more information and instead of the usual answer of some clever way of saying “no comment,” Netflix actually commented. The company specified the number came from the number of accounts that surpassed 70% of the runtime and clarified it counted every account once (so the number didn’t include any repeat viewings). Here’s the rub – that’s where the info stopped and from there it’s down the same rabbit hole as before. Netflix once again successfully chummed the waters and then let the feeding frenzy ensue. By answering questions, it actually opened the door to more questions which is a practice investors in the industry in this area are very familiar with by this point. Personally, my biggest question is why 70%? Wouldn’t you try to find a number like 75% which represents 3/4 of the film or even 50/51% to show that people watched at least half the movie? 70% just seems like an odd choice and it makes me wonder how precipitous the drop-off was at 75% that they wouldn’t use it? Or was it the opposite and too high of a number to be believable? Not that 45 million is believable either, but that’s expected when talking about Netflix which makes claims that they have no intention of backing up. And that’s also the point. We’ve reached a new world where companies don’t have to be held to the same standards as others and it creates a Wild West of sorts. Investors can enjoy the windfall now, but they also need to just be warned this is a dangerous game Netflix is playing in the long-run. They opened Pandora’s Box and right now it is benefiting them, but it is only a matter of time until it backfires. No seriously, how does that work? Does that mean it counts views at 70% of run-time for movies, but not TV series? Or does that mean it counts views at whatever percent helps its case more? Again, because there’s no checks and balance, they don’t have to answer that question. Or any follow-ups. Yet, what is unfortunately buried in this whole thing is that if you take the numbers out of this for a second, you’ll see a movie starring a talented actress and directed by a gifted female director (Emmy-winner Susanne Bier) was able to garner this type of positive response from the public. We should just take a second to recognize that as in this day and age it is sadly a rarity. These women deserve an immense amount of credit for the work they shepherded. To be fair, it is also a statement to the industry by Netflix that it is willing to be a change-maker in that regard – but by not releasing verifiable numbers, it doesn’t do people like Bier a lot of good when making future deals. That’s also part of the reason why Crazy Rich Asians’ writer Kevin Kwan picked a traditional studio over Netflix when selling the film rights. He wanted to have something concrete he could show the industry as proof that American audiences will see a movie headlined entirely by Asian actors – but that’s a story for another day. For now, yes it looks like it’s Netflix’s world now and we are just living in it, but investors shouldn’t drink the Kool-Aid without realizing there’s likely more to these stories that we don’t know and more we should know that can help better the industry. 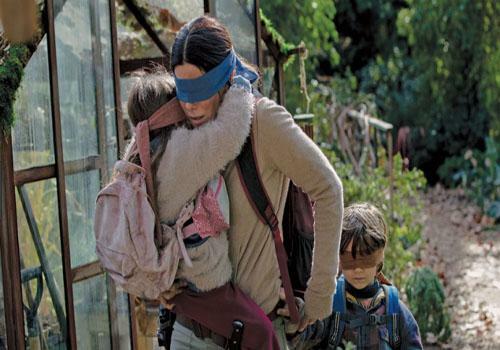 And by the way, phenomenon is a good way to describe it as this week Netflix again took to Twitter, but this time to ask its viewers NOT to partake in what has been dubbed the Bird Box challenge. Because the Internet is the Internet, social media users decided to see which everyday tasks they could accomplish while blindfolded (as the characters are for most of the film). Hint, it did not go well. Regardless, the fact remains the movie hit the mark for Netflix, and numbers aside, it did exactly what it was intended to do – start a conversation.